Why: If there was a single emotion we felt upon completing this book it was probably jealousy... and a pinch of bitterness. Fine, we’ll just say it – We want to be the Walker children! Seriously, how cool would it be to sail to an uninhabited island and set camp for an extended period of time? Actually, our utter lack of seaworthiness would have prevented us from reaching any sort of island. Still, we make a habit of living vicariously through books. Swallows and Amazons is a story about 4 children who win approval from their parents to camp on an island near their summer lake home. Roger, the most experienced sailor takes the helm of Swallow and sets sail with his siblings for Wild Cat Island. The adventures that follow are as vast as their imaginations and when the Walker’s bump into a pair of sisters who sail Amazon, the stakes are raised even higher. And then, when a theft occurs on a nearby house boat, the stakes are raised even higher. And then... sorry, we’ll be done. 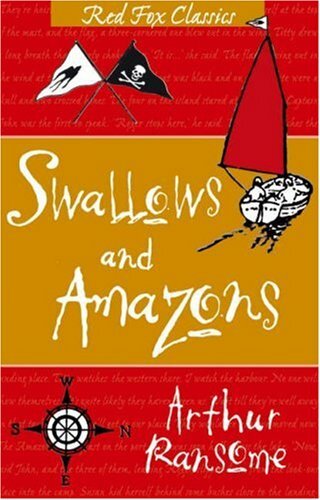 What we loved about this novel is how well Arthur Ransome captured the adventurous spirit within all children. Throughout, the Swallows and the Amazons strive to stay in character, forcing the reader to take their camping experiences seriously. Anyone not on the island is a native, lemonade is rum, and the menacing owner of a nearby houseboat is the dreaded pirate from Treasure Island (not Long John Silver). The characters felt real. The relationships felt real. Even the staged sea battles felt real. Our only advice to US readers: brush up on your British nautical terms. Awww, this sounds so cute. I would be completely jealous, too. Actually, I wouldn't even have to go alone to camp - I just want a summer vacation island. I'm easy to please!